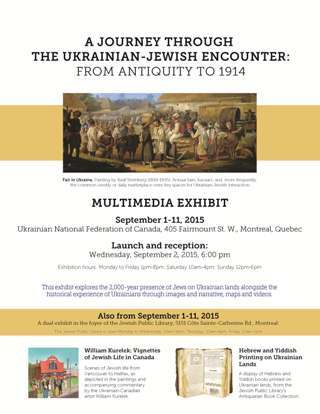 MONTREAL, August 10, 2015: The Ukrainian Jewish Encounter (UJE), the Ukrainian National Federation of Canada, and the Montreal Jewish Public Library are pleased to present an exhibit entitled A Journey Through the Ukrainian-Jewish Encounter: From Antiquity to 1914. 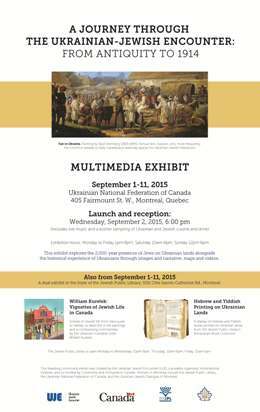 The exhibit will be shown September 1–11, 2015 at 405 Fairmount St. W., Montreal. An opening reception will take place on Wednesday, September 2, 2015, 6:00 pm at the same location. The exhibit will be open Monday to Friday 1p.m.-8 p.m.; Saturday 10 a.m.-4 p.m.; Sunday 12 p.m.-6 p.m. Created by UJE and co-funded by Citizenship and Immigration Canada, this multi-media exhibit explores the 2,000-year presence of Jews on Ukrainian lands alongside the historical experience of Ukrainians. Through images and narrative, maps and videos, the exhibit highlights the interaction between these two stateless peoples in all its complexities—side by side over long periods of normal co-existence conducive to cross-cultural fertilization, as well as periods of crisis and conflict under diverse political regimes. The intertwined Ukrainian-Jewish story up to the end of tsarist Russian rule and Habsburg Austro-Hungary is of enduring interest to both Ukrainian and Jewish audiences because for centuries the territory of modern-day Ukraine was the homeland of one of the most populous Jewish communities in Europe and is the place of origin of the vast majority of Ashkenazi Jews today. It is also of interest to a wider public as a compelling and enlightening case study of intergroup relations. 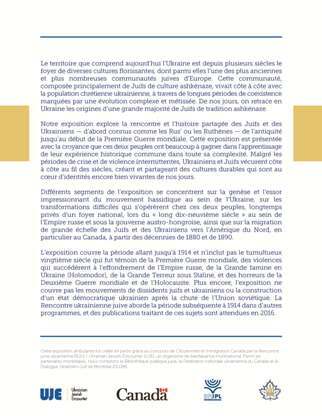 This travelling exhibit was shown and well received in Ukrainian and Jewish community and cultural centres in Toronto, Winnipeg, and Edmonton between May and August 2015. Plans are under way for the exhibit to travel to cities in the United States, Ukraine, and Israel in 2016. 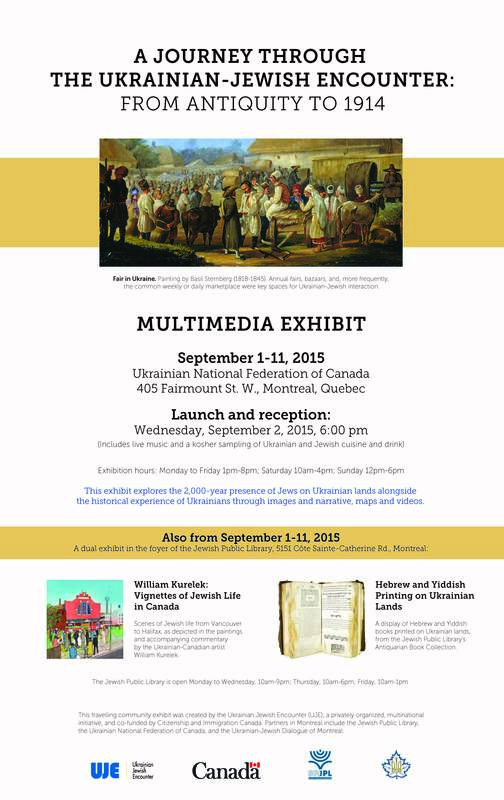 Paintings of scenes of Jewish life from Vancouver to Halifax, as depicted in the paintings and accompanying commentary by the Ukrainian-Canadian artist, William Kurelek. A display of Hebrew books printed on Ukrainian lands, from the Jewish Public Library’s Antiquarian Book Collection. 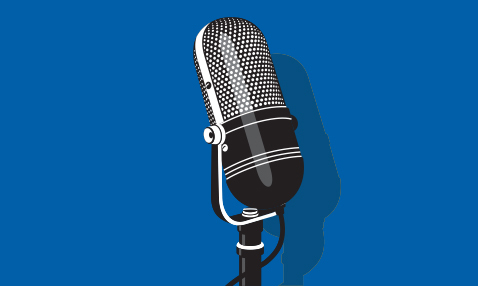 Hours: Monday to Wednesday, 10 a.m.-9 p.m.; Thursday, 10 a.m.-6p.m. ; Friday, 10 a.m.-1 p.m. 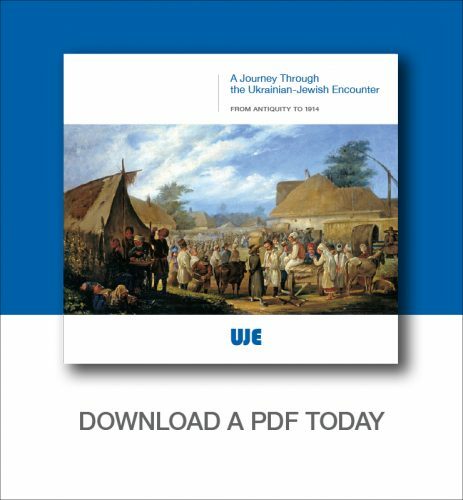 The Ukrainian Jewish Encounter (UJE) is a privately organized multinational initiative launched in 2008 by a group of individuals from Canada, the United States, Ukraine, and Israel. 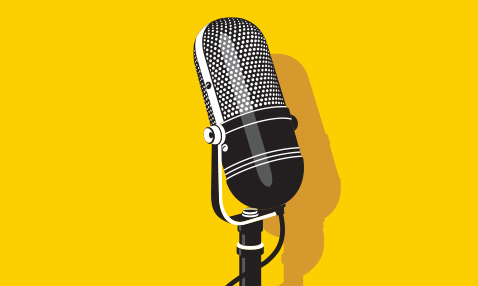 Its work engages scholars, civic leaders, artists, governments and the broader public in an effort to promote deeper mutual comprehension between the two peoples.